More things you may not have known about ant. With our last post about ants, we talked about three colony facts. This time, we want you to know about Myrmica rubra Linnaeus, also known as the European red or fire ant. A lot of insect pests have found their way into New Jersey from other areas of the world. Although many people think that this ant species has always been in the state, the European red ant is a foreign species. As the University of Florida Institute of Food & Agricultural Studies notes, Myrmica rubra is dangerous and invasive. These fire ants sting and release a toxic venom that causes some people to experience anaphylaxis. They also densely infest an area — up to 1 1/2 nests per every square meter — and one colony can have several nests. Unlike many ant species, European red ants have multiple queens per colony. Finding and destroying every queen and her eggs is difficult without professional help. 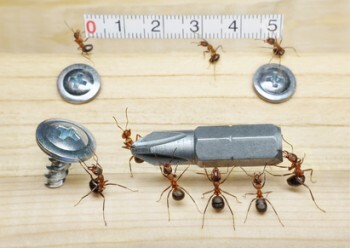 Humans help spread these ants to new locations. Red ants don’t always sting and they can be nesting in or traveling through/across the soil, mulch and plants you use for landscaping and gardening. They also nest around construction materials like logs, wood boards and stone. For more information about these and other red ant species, call us today. Allison Pest Control provides a wide variety of Holmdel pest control solutions. Look no further for a Monmouth County pest expert!